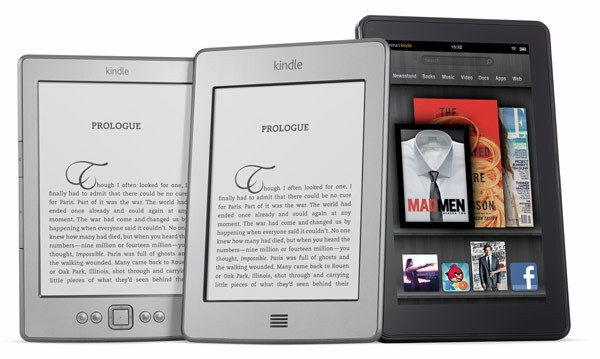 SEATTLE, Sep 28, 2011 (BUSINESS WIRE) -- (NASDAQ: AMZN)--Millions of people are already reading on Kindles and Kindle is the bestselling e-reader in the world for four years running. Today, Amazon is excited to introduce an all-new Kindle family: three all-new Kindle e-readers that are smaller, lighter, and more affordable than ever before, and Kindle Fire - a new class of Kindle that brings the same ease-of-use and deep integration of content that helped Kindle re-invent reading - to movies, TV shows, music, magazines, apps, books, games, and more. The new Kindle Touch is only $99. Kindle Touch is available to customers in the U.S. for pre-order starting today atwww.amazon.com/kindletouch and ships November 21. Over 100,000 movies and TV shows from Amazon Instant Video, including thousands of new releases and popular TV shows, available to stream or download, purchase or rent - all just one tap away. Amazon Prime Members enjoy instant, unlimited, commercial-free streaming of over 11,000 movies and TV shows at no additional cost. Kindle Fire comes with one free month of Amazon Prime. Over 1,000,000 Kindle books, including thousands of bestsellers, children's books, comic books and cookbooks in rich color. 100 exclusive graphic novels, including Watchmen, the bestselling - and considered by many to be the greatest - graphic novel of all time, which has never before been available in digital format, as well asBatman: Arkham City, Superman: Earth OneGreen Lantern: Secret Origin and 96 others from DC Entertainment. Hundreds of magazines and newspapers - including The Wall Street Journal, The New York Times, USA Today, Wired, Elle, The New Yorker, Cosmopolitan and Martha Stewart Living - with full-color layouts, photographs, illustrations, built-in video, audio and other interactive features are available from the new Kindle Fire "Newsstand." 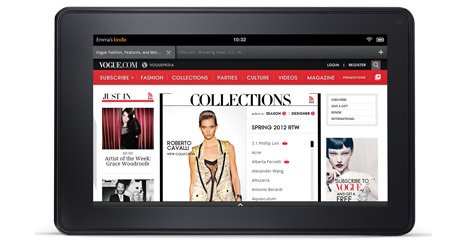 Kindle Fire customers will enjoy an exclusive free three-month trial to 17 Condé Nast magazines, including Vanity Fair, GQ and Glamour. Amazon and its affiliates operate websites, including www.amazon.com, www.amazon.co.uk,www.amazon.de, www.amazon.co.jp, www.amazon.fr, www.amazon.ca, www.amazon.cn,www.amazon.it, and www.amazon.es. As used herein, "Amazon.com," "we," "our" and similar terms include Amazon.com, Inc., and its subsidiaries, unless the context indicates otherwise.